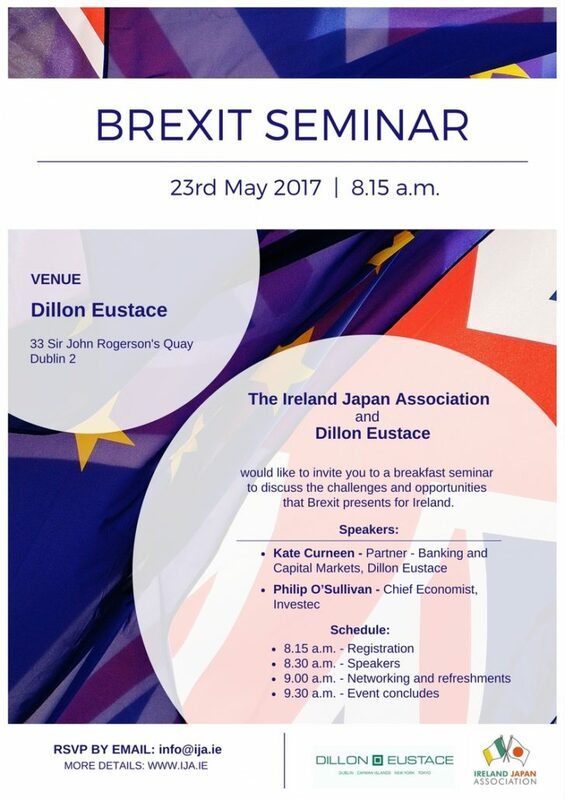 The Ireland Japan Association and Dillon Eustace would like to invite you to a breakfast seminar to discuss the opportunities and challenges that Brexit presents for Ireland. Time: 8.15 a.m. – 9.30 a.m.
Kate joined Dillon Eustace in 2012 and became a partner in the banking and capital markets department in 2016. Her practice covers a wide range of debt finance work, including structured finance, corporate and asset based lending and debt capital markets. Kate has advised a wide range of vendors, purchasers and financiers of distressed and non-performing loan portfolios, as well as in connection with the related restructuring, workout and refinancing. She advises clients on regulatory matters, including consumer and SME lending, authorization and compliance issues, passporting, credit servicing and arrears resolution. Philip O’Sullivan joined Investec Ireland as Chief Economist in September 2012 and took on a broader role as Head of Macro-Financial Research in June 2016. His current remit covers responsibility for the production of research on the economy (both domestic and global), property market and the financial services sector. Philip previously worked for Goodbody Stockbrokers and Business & Finance and was educated at UCC, UCD and LSE. Please feel free to share this event with your colleagues/LinkedIn.